Published: Dec. 2, 2018 at 03:12 p.m. Published: Nov. 25, 2018 at 03:48 p.m.
Carolina Panthers running back Christian McCaffrey catches a screen pass from quarterback Cam Newton and glides into the end zone for a go-ahead 2-yard touchdown. 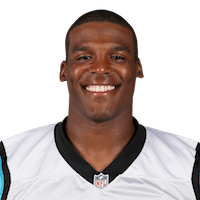 Published: Nov. 25, 2018 at 02:52 p.m.
Carolina Panthers quarterback Cam Newton takes off and shows off his speed as he races for 26 yards.